From touching student testimonies to appreciative words and kind gestures, the annual Phillips Community College Foundation (PCCF) Scholarship Luncheon at Phillips Community College of the University of Arkansas (PCCUA)-Helena is a reminder of the importance of giving to benefit others. Student speaker Taronza Ware, who is majoring in behavioral health, shared her story saying after going through some rough times, she came to Phillips where she was given a scholarship and other support that helped get her through the difficult times, put food on the table and care for her children while she worked toward her degree. Nursing student Lauryn Galvin said personal health issues were a major challenge to completing her degree, but after receiving her scholarship, she didn’t have to worry about covering school expenses while getting through college. Speaking on behalf of her family, PCCUA alumna Kaneisha Gilmore said she appreciated PCCUA not only for the financial assistance she received, but for the personal support from a caring faculty and staff. Gilmore, who has gone on to obtain her Master’s degree from Delta State University in finance, says she will be applying to the doctoral program soon. “To the students here today, I say keep pushing,” she stressed. Also in attendance, Gilmore’s mother, Jerlene, said Tuesday’s luncheon marked the 8th anniversary of her son, Michael Gilmore’s, death. 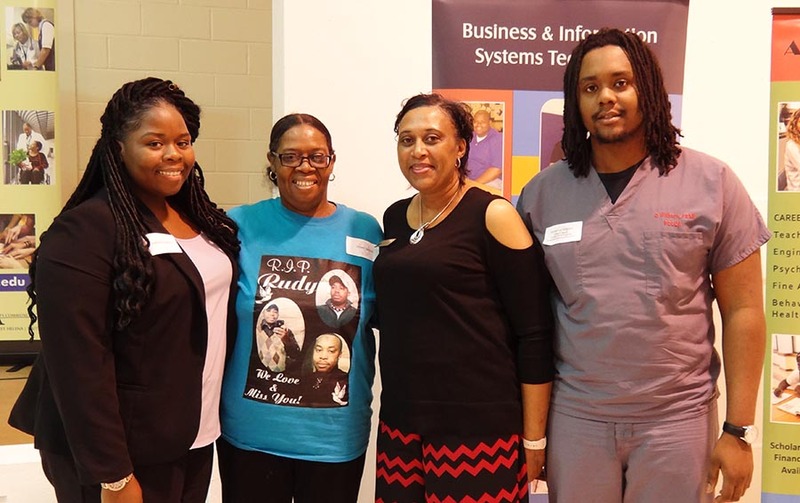 The Michael Gilmore Memorial Scholarship was established by Elijah and Jerlene Gilmore in memory of their son, a PCCUA graduate who was killed in 2010 while a senior at Arkansas State University (ASU) in Jonesboro. The luncheon provides an opportunity for contributors to be recognized for playing a significant role in the excellence in education that PCCUA has been able to achieve. Scholarships provided through the Foundation are made possible solely through private giving to the PCCF, which is a non-profit organization that assists the college in funding various activities that state funding doesn’t provide. Many people have the ability to give and make a difference. Join the Foundation as a contributor today and see how it not only changes students’ lives, but entire communities as well. To make a donation or establish a scholarship, call Rhonda St. Columbia at (870) 338-6474 , ext. 1130.